My friend and business partner,ALLAN JARLOS, recently offered to give me a license for the latest MAC OSX upgrade – SNOW LEOPARD. I politely declined saying that doing so would require me to re-install under boot camp my daily OS of choice- Windows 7. Besides, I hardly ever use MAC OSX anymore since I downloaded the Windows 7 beta. I told him that although my everyday computer is a MACBOOK Air, it is practically a PC since I only use it with Windows 7 running under boot camp. I detailed in this post some of the Windows 7 experiences that made me fall in love with this soon to be released OS from Microsoft. As it turns out, a veteran tech columnist and analyst Joe Wilcox would have done the same. 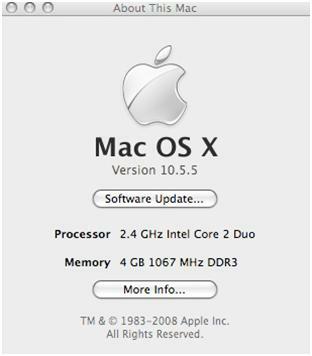 The Mac OS X user interface, once trendsetting, is now a tired motif overdue for overhaul. Worse, Apple hints at what the UI could and should be in a few places, with QuickTime being the most visible example. The QuickTime UI is refreshing and new -- delightful. Something similar should skin much of Snow Leopard. Worse still, QuickTime's more modern UI is jarring reminder when switching back to the Snow Leopard Finder about how old most of the rest of Mac OS X feels. By comparison, Windows 7 feels surprisingly fresh. Microsoft is finally doing good user interface design. I find myself to be way more productive using Windows 7 than any Mac OS X version, and that's surprising to me. For years, the greater productivity claim belonged to Mac OS X. Consistently, I get about 30 percent to 40 percent more work done using Windows 7 than either Leopard or Snow Leopard. Windows Vista doesn't rate. The combined usability flaws -- everything from slow resume from sleep to nagging pop-ups to UI pauses or hangs -- are too much for me to use Windows Vista any longer. More importantly, I have loads more fun using Windows 7 than Mac OS X. I haven't had this much fun using a Microsoft operating system since Windows 95. After more than three months running Mac OS X, I really missed Windows 7. By comparison, for the six months I primarily used Windows 7 test builds, I only missed Mac OS X for iLife. I can say that these are the same reasons why, for the past nine months, my productivity has greatly improved working mainly in Windows 7. My personal experience has only been stellar that all my computers are now running the Windows 7 release candidate. The same reasons why, in July of this year, I pulled the trigger and ordered 3 copies of Windows 7 at a pre-release price of $49.99 each. I find that writing down things that I have to do not only keeps me on track but also insures that things I have set out to do are actually accomplished. In keeping with the spirit of the coming new year, I started searching for a new method of collecting, maintaining, and updating my new year's TO DO LIST. 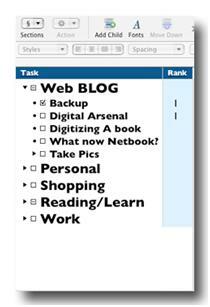 Outlook 2007 - The To Do list in the side bar is a great way of staying on top of emails that you've flagged or tasks you've created. To ways to keep tabs on an email: drag it to your Task List button to create a task from the email; or, flag it for follow up so it shows up in the To Do list. I know for a fact that either one of the above methods is an effective way of handling even the most complicated of TO DO LISTs. Even if I don't carry the HP 2710P tablet PC that much anymore, I can still run all those Windows software in the Macbook Alum or even in the MacPro under Parallels. But what I need really is just a simple system that no matter which of my computers I happen to be working on, I will have access to my To Do List. I have found the Google App TASK to be good enough for my needs but that is only accessible everytime I am connected to the web. Enter OmniOutliner 3.0 (OO3). It is a very powerful outlining software that may not be cheap at $69.95. It just so happened that it came bundled in the Macbook. I have barely scratched the surface of its overall functionality. I simply opened the provided ToDoList template and found it to be exactly what I was looking for. OO3 comes with a very well written user's manual that any user wanting to dig deeper into OO3 will find useful. After typing my initial list, I simply saved the document inside my Magic Briefcase folder. I then created a 'trigger' (CTRL+SHIFT+T) in Quicksilver to automatically launch my newly created ToDoList. Here is my workflow: 1. CTRL+SHIFT+T to open my List; 2. Type in any updates in my list;3. Hit CMD+S to save the file; and 4. Hit CMD+Q to quit. Now, to be able to access this list in any of my computers, I would need SUGARSYNC and OO3 running in all of them. SUGARSYNC is a no brainer since it does not limit the number of computers syncing with Magic Briefcase. For OO3, I would need to buy a license for each of my computer. I settled for a trial version and installed that in the MacPro. Sure enough, after replicating the above steps in the Macbook ALUM, whatever changes I make in the ALUM is automatically (assuming that SUGARSYN is connected online) visible. This system will be my primary mode of handling my ToDoList for 2009 or at least until one of the trial version expires. What system do you use to handle your ToDoList? As stable as the OS X may be, the prudent user must know that computer hardware are more prone to crashes (read: hard drive failures) and should prepare accordingly. Although, I have not experienced any need for a backup since the switch, prudence dictates that everybody should have one. In fact I have a redundant system (i.e. entire hard drive images are stored in an external hard disk while files are backed-up on the web via Sugarsync). Since I no longer use MS OUTLOOK, I had to backup all of my emails which are all stored online in Gmail. I saw this Step by Step guide in backing up Gmail on the Mac using GMAIL BACKUP and Python. It seemed pretty straightforward but I decided to try another route – Apple Mail. I just setup Apple Mail to download all my emails and was done in under an hour. I did some random checks to see if Apple Mail was able to download everything, and it did. EMAILS – Check. 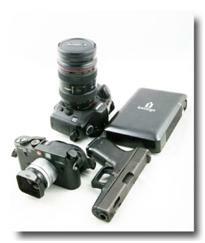 Since I am already syncing all my current files via the Magic Briefcase of Sugarsync, this should be a piece of cake. I simply compared the contents in all of my computers to insure that all file versions are the same, and they are. My workflow in using Magic Briefcase is similar to my use of Powerdocs folder. Backup all current files – Check. Finally, I need to have a bootable image of all the hard drives in all my computers. I did not bother with Leopard's Time Machine since it does not allow for saving bootable backups. I went straight to the old and reliable Superduper. Using the same IOMEGA HD 400 gig triple interface, I just created a new partition to accommodate the new Macbook Aluminum. I actually referred back to an old post here in order to clone the MacPro, the Alum, and the netbook OS X. Bootable backup of all computers – Check. Considering that the Iomega is now more than a year old, I have included in my to do list the need to look for another external drive that, this time, could handle a RAID system. And that's that. I can now sleep soundly knowing that I have at least two copies of every single file and software that I have used for the past year. If you are still reading this blog, stop procrastinating and go backup your important files. The number is about half of what I installed in the old Macbook. Obviously, this also reduced the amount of time for me to get the ALUM up and running. It took me around two hours to install everything with most of this time eaten up by the XP installation. There was no need to synchronize email (I leave that to Gmail) or any files (done for me automatically by Sugarsync). Thin. 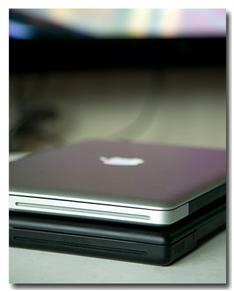 At about 1/10 of an inch thinner that the old Macbook, I was surprised that it fits snugly in my favorite netbook bag. Speed. 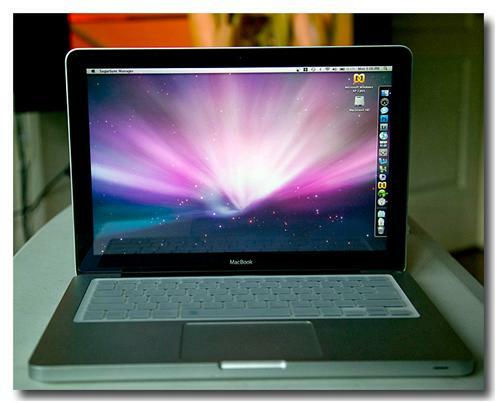 It launches applications significantly faster than the old Macbook 2.16 ghz with 2 gig RAM. I guess the 4 gig ram and the 2.44 ghz processor is a good combination. Battery Life is much improved. I now get between 4-5 hours of normal use (wifi-on, running parallels only when I need to). Even the old battery geek also works which gives me an additional 2-3 hours runtime. If I really must say something that I don't like about the ALUM, it has to do with the software update 10.5.6 from Apple. You will note from the picture above that I have not downloaded this update yet due to reported issues with the 4 gig ram. So far, I have not experienced a single incident where the ALUM froze just like what is being reported by a number of users in the Apple forum. I will update mine only when I am sure that this issue with the 4 gig RAM has been resolved. Or, let me make a bootable image of the ALUM first using Superduper and depending on how daring I am on that day, I might give 10.5.6 a try. I guess that with the arrival of the ALUM in THQ, the question that begs to be answered is, "What happens now with the netbook? "More on this in my subsequent blogs.